In Japan, the most-well known non-profit organization for cheese is the Cheese Professional Association (or CPA). It hosts events, runs seminars, and conducts the Cheese Professional Certification Exam once every year. The standards by which people work and understand cheese in Japan is measured with their yardstick. And they have their own cheese character (as any respectable organization in Japan does), aptly named “Cheeseman”! This past weekend the CPA hosted an event around cheese and bread. The room was filled with artisan bakeries, cheesemakers, and small cheese shops from Tokyo and Kyoto. There was a strong sense of passion and commitment to artisanal products in the room. Each bread displayed a sign with “Cheeseman” recommended pairings and information on its particular type. Bread styles ranged from French pain de Campagne to German bauernbrot, with many original creations like a bread made with Earl Grey! Samples were plentiful. Bakers and cheesemakers were as enthusiastic to share their craft as guests were to enjoy it. To complete the trifecta, numerous wine shops, beer producers, and a whiskey culture group were in attendance. One glass of wine was included in the event ticket, and there were many opportunities to purchase another or enjoy free samples. To maximize enjoyment, special neckties were provided to hold wine glasses and event maps, lest hands not be ready to enjoy the bread and cheese. Every 20-30 minutes, a new pairing was featured at the central table. Brie and croissant, young Saint Maure de Touraine and toast, Mont d’Or and pain de Campagne, Gruyere and focaccia, Roquefort and pumpernickel, Japanese mascarpone and Melon Pan (iconic Japanese bread) — with one of each pairing, endless samples, and a couple glasses of wine, dinner was never a question that evening. Our bellies were full! While hiking in the Jungfrau region of Switzerland, the contrast of craggy mountains and soft wildflowers was something I could never adjust to. Rounding a corner onto a new vista repeatedly left me speechless to the raw, natural beauty. Gushing waterfalls, lush meadows, whispering forests, and sharp reliefs of rock and stone. All this contrast hiding in two valleys. For me, it defines the landscape of the Swiss alps in summer. Up past the tree line, the world is at first a soft grassy green, and then turns sharp, edgy and grey. While standing in the meadows, it’s easy to get lost in the expanse when there is so much right under your feet. Peek a little closer at the green and you’ll see that it is full of animals and summer blooms. Look up a little and dotted around are clusters of slowly-moving, grazing cows—tails swooshing back and forth, bells chiming. They too are enjoying the wildflowers. These vast high Alpine meadows—or alpages—come alive in summer, filling with wild grasses, herbs, flowers and brush. At the same time, herds of cows and their caretakers enter the high Alpine region. Every year for 3 to 4 months, alpine herders and their cows follow the slow retreat of the snow line up into the mountains. As they gain elevation, the air is clearer, the streams filled with fresh water, and the meadows rich with new grasses. It is heaven for all the cows who escape the winter isolation of their barns to roam freely in the sunshine. This process of moving beast and man up the mountain is called transhumance and has been practiced for thousands of years, conceivably ever since man domesticated ruminant animals. Consider the high alpine meadow. Above the tree line and closer to the sun, the intensity of the sunlight increases. The alpine plants that grow under such increased sunlight produce more energy. When consumed by a ruminant animal like a cow, it results in higher levels of protein and fat in the milk. In the same way, cows grazing at this higher elevation require more energy. These cows produce less but higher quality milk compared to a cow milked in the valley. If a cow produces milk with 15 to 30 percent more fat, the cheese will be richer and more flavorful. For any farmer and cheesemaker, a more flavorful cheese is a clear winner on the market. In the search for better milk and better cheese, transhumance developed into a tradition that has survived centuries. In the winter months, the high alpine meadows often serve as ski slopes. Cows grazing through the summer provide a valuable service of maintaining and “mowing” the steep slopes. While the herds are up in the mountains, farmers can use the valley fields to make hay for winter. A herd of cows can even change the makeup of an alpine meadow by preferring different grasses and flowers over others. Over time, different regions develop different compositions in the meadows. If the cows are eating certain grasses, herbs, or wildflowers in one area and not in another—as close as the other side of the mountain—the flavor of the cheese is affected. For now, I’ll simply remember the beautiful days spent hiking through the alpine meadows. Each time we turned a corner, I marveled at the journey the cows take every year. Slowly up to bountiful fields full of flavor and sunshine, and slowly down after they successfully clear it all away. On the outskirts of Sapporo, city life fades away as herds of cows speckle the fields on the hills. This is where Fattoria Bio has made Italian style cheeses since 2013. In the cool dampness of the cheese room, Italians work alongside Japanese. Caciocavallo hangs in the corner. Grana ages among its friends upstairs. In the middle of it all, Italian and Japanese cheesemakers work together to stretch some mozzarella and burrata into beautiful rounds. With Italian signs and pasta filata cheeses all around, it’s easy to forget that this is still Japan. The first notion of Fattoria Bio in Hokkaido came from Elio Orsara, an Italian chef who came to Japan in 1991 to work in the country’s best hotels. Orsara understood the value of hospitality and quality ingredients from his childhood where he spent much of his time at his grandmother’s “locanda”. When he opened his own Italian restaurant, Elio Locanda, in Tokyo in 1996, he wove the same values he grew up with into the fabric of the restaurant. From the beginning, Orsara made his own fresh cheeses in house but still wondered why no one produced good Italian cheeses in Japan. Partnering with Hiroyuki Takahashi (now CEO of Fattorio Bio Hokkaido), Orsara endeavored to create a cheesemaking operation focused on quality Italian cheeses. Takahashi understood the importance of this conviction and began the hunt for Japanese milk that could match the requirements of Italian cheeses. From the region of Calabria in Italy, Orsara looked homeward for traditional cheesemakers to work with and use as a model. On the Sila Plateau, Fattoria Bio’s Grillo family has been making cheese for 4 generations. To this day, they protect and value traditional cheesemaking methods. The Grillo family still practices transhumance, moving their herds up and down the mountains with the season. Fattoria Bio in Hokkaido is the offspring of this amazing farm and dairy in rural Calabria. In Hokkaido, after 5 years of searching, they finally found the right high quality milk just outside of Sapporo. Everyday milk is brought from the town of Kita Hiroshima to the Fattoria Bio cheesemaking facility. What couldn’t be faked was the years of inherited tradition and technique in cheesemaking of Italy that barely exist in Japan's young cheese industry. Fortunately, they didn’t have to look too far for the right cheese master. Giovanni Graziano spent his childhood in Calabria helping his father, who was also a cheesemaker. When he was just 20 years old, he started work as the Cheese Master for Fattoria Bio in Calabria, where he stayed for 15 years. Graziano moved to Japan to start Fattoria Bio in Hokkaido and now runs the cheesemaking operation. He is the face of Fattoria Bio Hokkaido, assuring that all the cheeses are up the standards of a great Italian cheesemaker. Currently, Fattoria Bio in Hokkaido makes 20 styles of Italian cheeses including mozzarella, burrata, bocconcini, caciocavallo, ricotta, and grana. They received awards at both the Mondial du Fromage and the Japan Cheese Awards. Most cheeses are sold online (here) and through direct orders from restaurants and high-end department stores. Some cheeses can be found at Elio Locanda Restaurant, Isetan Shinjuku Department Store, or National Azabu Supermarket in Tokyo. Fattoria Bio is a collaboration between two countries with one singular purpose — to make truly great Italian cheeses for Japan. Instead of importing cheeses that suffer from milage and the hindrance of cost, Fattoria Bio imported Italians with the inherited skills to make Italian cheeses with high-quality Hokkaido milk. It is a marriage of quality and tradition, two things highly valued in both Japan and Italy. Fattoria Bio delivers with perfection. 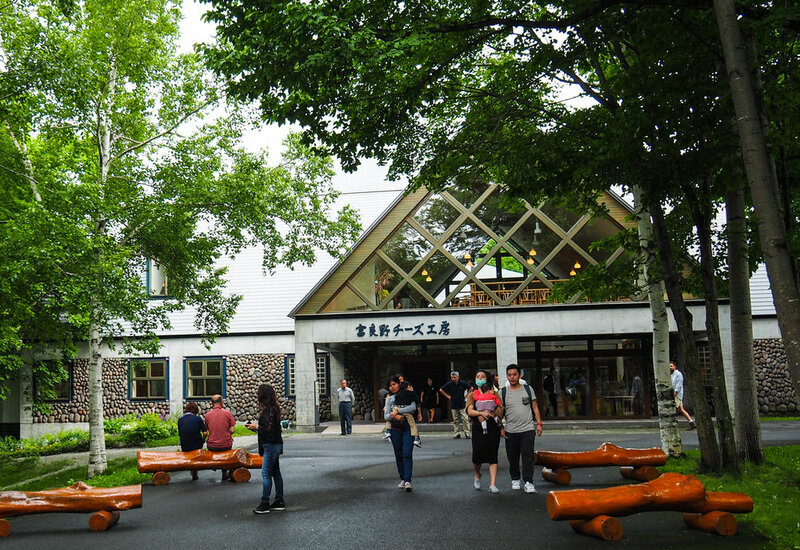 Furano is a major draw for Hokkaido’s tourists in both winter and summer. When the snow is deep and the powder pristine, the town fills with families and ski bums alike. In the warmer months, especially the middle of July, tourists descend in droves to the picture-perfect lavender fields nearby. The town rests in a valley with steep mountains to one side and rolling hills on the other. On one long hill is Furano Cheese Factory, catering to tourists in search of Hokkaido-made cheese. Through a little education, delicious food, and a beautiful location, Furano’s tourists leave with a full belly and an appreciation for Hokkaido cheese production. At Furano Cheese Factory, cheese is ever-present from the moment guests walk in. The glass window at the entrance looks onto the cheesemaking room. Visitors can watch as milk is set, curds are cut, and molds are filled. From the next window, it’s possible to see cheeses being wrapped and packaged. The upstairs resembles a little cheese museum with exhibits about international cheeses. Learn about the history of dairy and cheese in Japan, play cheese-themed games and take pictures with a life-sized milking cow. In the gift shop, three kinds of cheese are available to taste. What I was most excited to try was Furano Cheese Factory’s squid ink cheese. From the outside, the round looks like a camembert, all white and pillowy. However, as soon as it’s sliced, the pitch-black interior creates a dramatic contrast. At this moment, the phrase “black as ink” is an honest description. For the Japanese, to whom squid ink is a relatively flavorless and common ingredient in pastas, breads and sauces, a black cheese isn’t off-putting. For Westerners, it looks down-right sinister. Furano Cheese Factory makes other interesting cheeses as well: onion gouda, Furano wine marbled gouda, Camembert, butter and milk. In the attached pizza parlor, the cheeses are ready for prepped taste buds. Pizzas are topped with fresh mozzarella and made to order. For dessert, homemade soft cream waits nearby. The soft cream shop is not hard to find with the steady stream of people walking out distractedly, eyes on their milky-white treat. Furano Cheese Factory also offers cheesemaking classes, but doesn’t do tours. We didn’t have the opportunity here to meet with the cheesemakers, being a larger commercial operation that mainly caters to one-time visitors. So we simply enjoyed tasting the unique selection of cheeses and blending in with the crowd. Tokachi Millennium Forest bridges the gap between tourist attraction and natural wonder. With a cafe, working goat farm, numerous gardens and beautiful landscape design, it appeals to the average tourist and nature lovers alike. Spend a few moments sitting by the creek as the chimes tinkle over head, feed the friendly sheep next to the flower garden, stroll with a soft cream in hand, or wander up the hill for a view of verdant Shimizu. Even on a rainy day, the rolls of the hills and nature's soft sounds are captivating. Ran Ran Farm is just one section of Tokachi Millennium Forest. On the farm, there are approximately 150 Saanen goats that provide the milk for over 10 different cheeses. While grazing, the white bodies of the Saanens contrast beautifully against the green fields. Guests can visit the milking parlor and feeding area that lead to the cheesemaking facility but are not able to tour inside. For a cheese experience, Ran Ran Farm offers cheesemaking classes with a reservation. We didn’t have the opportunity to meet the cheese-making team here, but it was worth seeing the beautiful countryside with one of the only goat cheese producers in Japan. For more information about Ran Ran Farm and Tokachi Millennium Forest, check out the blog post on their Chèvre in Olive Oil here.